Background: The attitude of research on addiction has been done on the key role of glutamate. As a regard, the prelimbic cortex (PrL) has an important role in addiction, learning, and memory. We tried to investigate the level of glutamate and aspartate concentration after glutamate receptors blockade in this region in the morphine-addicted rats. Materials and Methods: In this study, we examined the effects of local infusion of the N-methyl-D-aspartate receptor and α-amino-3-hydroxy-5-methylisoxazole-4-propionic acid receptor antagonists, 2-amino-5-phosphonovaleric acid (AP5), and 6-cyano-7-nitroquinoxaline-2, 3-dione (CNQX), into the PrL cortex on the level of excitatory amino acids (EAAs) and glycine. After 11 days of self-administration, the prelimbic area of the brain was taken out, and the EAAs and glycine concentration was measured by high-performance liquid chromatography. Results: Morphine resulted in the significant increase in the EAAs concentration within this area (P ≤ 0.001). Microinjection of AP5 into this region before using of morphine significantly decreased the morphine-induced glutamate and aspartate concentration (P ≤ 0.001). CNQX had the same effect and significantly reduced the EAAs concentration compared to the morphine group (P ≤ 0.001). In addition, microinjection of AP5 and CNQX simultaneously increased glycine concentration (P ≤ 0.001). Conclusions: These results show that morphine stimulates the EAAs release in the prelimbic area. It seems that microinjection of AP5 or CNQX in this region is effective in reducing morphine-induced EAA. It is suggested that EAA transmission in the PrL cortex may be a possible target for treatment of morphine addiction. The excitatory amino acids (EAAs) neurotransmission plays an important role in diverse physiological and pathophysiological processes. Glutamatergic transmission accounts for up to 70% of synaptic transmission in the central nervous system. It is well known that nondopamine components such as glutamate may be also involve in the opiate addiction and thus may be a key target for possible novel pharmacological treatments., There are glutamatergic projections and/or neurons expressing glutamate receptors in some regions of the brain, including the mesocorticolimbic dopaminergic regions which provide an anatomical basis for the role of glutamate in addiction. It is notable that descending glutamate inputs from PrL is projected to the ventral tegmental area and the nucleus accumbens. To date, many studies have done on the role of glutamate transporters and receptors on addiction and all of them acknowledge the important role of glutamate in addiction. It can be said that glutamate homeostasis has a direct impact on the drug-seeking behaviors of addictive substances in various ways. As yet the role of the EAAs transmission in the morphine addiction within the prelimbic area is not fully understood. Although several studies have shown that systemically administration of N-methyl-D-aspartate (NMDA) and α-amino-3-hydroxy-5-methylisoxazole-4-propionic acid (AMPA) receptors antagonists increase glutamate release in the mPFC (medial Prefrontal Cortex),, other studies provide conflicting results., For example, activating NMDA receptors in mPFC through local application of NMDA has been shown to increase glutamate release. The study of the interactions between EAAs and morphine can be expected to provide a basis for understanding effects of morphine and to ultimately provide an insight into the biochemical mechanisms that are involved in addiction. Increasing evidence indicates that the mPFC is a critical site mediating the effects of glutamate receptors antagonists. For example, systemic administration of NMDA receptor antagonists may attenuate signal transmission efficiency of the mPFC. Furthermore, systemic application has been shown to change the release of neurotransmitters such as glutamate in the mPFC. Glutamate and its receptors play an important role in morphine addiction, and these findings have increased our understanding of the neuropathological processes associated with morphine addiction and have provided new targets for pharmacological approach to the treatment of opioid addiction. Thus, the purpose of our study was to investigate interaction between the releases of EAAs follow intravenous injection of morphine and find that the role of glutamatergic system to addiction process. In this experiment, male Wistar rats weighing 270–320 g were used (Pasture Institute, Karaj, Iran). Before the surgery, the rats were housed five per cage, under standard conditions (temperature 22 ± 1) at a 12 h dark/light cycle (lights on, at 7:00 am). They had ad libitum access to fresh tap water and food pellets, but during the first 5 days of the experimental period, they had food restriction in their cages. After the surgery, the animals were placed in the individual home cages and allowed to recover from the operation for 5 days, before starting the experiments. All the animals of experiments were conducted, in accordance with the Guide for the Care and Use of Laboratory Animals (1996, published by National Academy Press, 2101 Constitution Ave. NW, Washington, DC 20055, USA). The drugs used in this study were morphine sulfate (Temad, Tehran, Iran), 6-cyano-7-nitroquinoxaline-2, 3-dione (CNQX), 2-amino-5-phosphonovaleric acid (AP5), and chloral hydrate, purchased from Merck (USA). All drugs were dissolved in sterile 0.9% saline, except CNQX, which required a 1% dimethyl sulfoxide vehicle. Male rats were randomly selected and divided into seven groups: I and II – saline and morphine groups, receiving 0.1 ml saline or morphine (5 mg/mL morphine sulfate in saline or 0.5 mg/kg per infusion) in the self-administration sessions; III and IV – AP5 groups, receiving both minimum (0.1 μg/0.5 μL) and maximum (1 μg/0.5 μl) doses, 10 min before each session and morphine in the self-administration sessions, respectively; V and VI – CNQX groups, receiving both minimum (0.5 μg/0.5 μL) and maximum (2.5 μg/0.5 μL) doses, 10 min before each session and morphine self-administration sessions, respectively; and VII – coadministration group, receiving both CNQX (2.5 μg/0.5 μL) and AP5 (1 μg/0.5 μL), 10 min before each session and morphine in the self-administration sessions. The animals were anesthetized with 10% (450 mg/kg) chloral hydrate and placed in a stereotaxic apparatus. Stainless steel guide cannulae (22G) were implanted using the following stereotaxic coordinates (in mm). For the PrL: From bregma, AP +3.2, L +0.8, and from the dural surface, DV −3.6. Immediately following the stereotaxic surgery, a cannula filled with heparin saline was inserted into the right jugular vein and was guided subcutaneously up to the skull. The cannula was fixed on the skull with metal screws and dental acrylic cement. The microinjections were performed unilaterally. Different doses of CNQX (0.5 μg/0.5 μL and 2.5 μg/0.5 μL) and AP5 (0.1 μg/0.5 μL and 1 μg/0.5 μL) were injected with a rate of 2 μl/min into the PrL, 10 min before the self-administration phase. Testing was done in standard operant conditioning cages based on the method used previously by others, with minor modifications. The jugular cannula of rats was connected to an infusion pump, and the animals were placed in the self-administration apparatus for 2 h and each day, during 11 consecutive days on an FR-1 schedule. The trained animals were allowed to press active and passive levers freely. By pressing the active lever, the rats received 0.1 ml of morphine (5 mg/mL morphine sulfate in saline or 0.5 mg/kg per infusion) and small pellets in the first 5 days and morphine without pellets in the final 6 days of the experiment. Pressing the passive lever did not deliver fluid or food. All rats were decapitated without anesthesia; their brains rapidly removed and stored on −80°C until for high-performance liquid chromatography (HPLC) analysis. In order to prepare samples for HPLC analysis, the frozen brains were placed in a rat brain matrix on an ice-chilled plate. Double-edge blades were used to prepare coronal sections approximately 2 mm thick. The partially frozen slices were placed on an ice-cold plate for the removal of discrete brain region and then PrL cortex was microdissected using a punch technique (2 mm diameter). Tissue punches from the left hemispheres were weighted and placed in 1.5 ml microcentrifuge tubes which contained 1 ml of chilled homogenization buffer (0.1 M citric acid, 0.1 M sodium dihydrogen phosphate monohydrate, 5.6 mM octane sulfonic acid, 10 μm EDTA in 10% (v/v) methanol solution, and pH 2.8 with 4 M NaOH). Subsequently, isolated brain tissues were homogenized which using a homogenizer. After a thorough homogenization, each sample was sonicated for 4 s (Sonoplus, Bandelin), centrifuged at 14,000 rpm (Mikro 22R, Hettich, Germany) for 15 min at 4°C and the supernatant stored at −20°C until derivatization for neurotransmitters analysis. The analysis of amino acids was performed as described previously. An internal standard (carboxymethyl cysteine; Sigma, St. Louis, MO) was added after collection. Precolumn derivitization with o-pthalaldehyde and mercaptoethanol was performed by an autoinjector (SIL-30A; Shimadzu Scientific Instruments, Columbia, MD). The samples in the autoinjector were maintained at 14°C by a Peltier thermoelectric sample cooler. The sample and reagent were allowed to react for 2 min. Then, 20 μL of the mixture was injected into a Prime sphere 5 m C18-HC column (1004.6 mm; Phenomonex) fitted with a Prime sphere guard column (30 4.6 mm) with Pump 30A Nexera X2. The mobile phase was 0.1 M phosphate buffer containing 0.01 M EDTA, pH 6.35. Acetonitrile was used as the organic eluent, with a gradient profile of 10%–100%. Amino acid derivatives were detected using an RF-20A fluorescence detector with excitation and emission wavelengths set at 330 and 450 nm, respectively, and flow rate 1.3 ml/min. Data were taken by a personal computer using EZChrom 1–2 software and quantified on the basis of peak area by comparison with standards injected throughout the run. A chart recorder recorded peaks and peak heights were measured. The values were normalized by comparison with an external standard curve. The results were expressed in micromol per liter. The HPLC analysis was done in Mahdieh Medical Diagnostic Center. Data were presented as means ± standard error of the mean. One-way ANOVA and Turkey's posthoc was used to compare the mean concentration of the excitatory and inhibitory amino acids in different groups. The criterion for statistical significance was P < 0.05. The result of self-administration of morphine demonstrated that animals in the morphine group showed an increasing trend in drug intake, during the 11 days, even after removal of food restriction. These observations demonstrated that increase in the active lever pressing of the final 6 days in the morphine group is not related to the restriction of food and probably reflect the animal's tendency to get morphine. In contrast to morphine group, the mean number of active lever pressing in the NMDA and AMPA receptor-blockade groups decreased and attenuated the reinforcing the effects of morphine (the results of self-administration published by Can. J. Physiol. Pharmacol. 96 (8): 815-822 (2018) dx. doi. org/10.1139/cjpp-2017-0758). 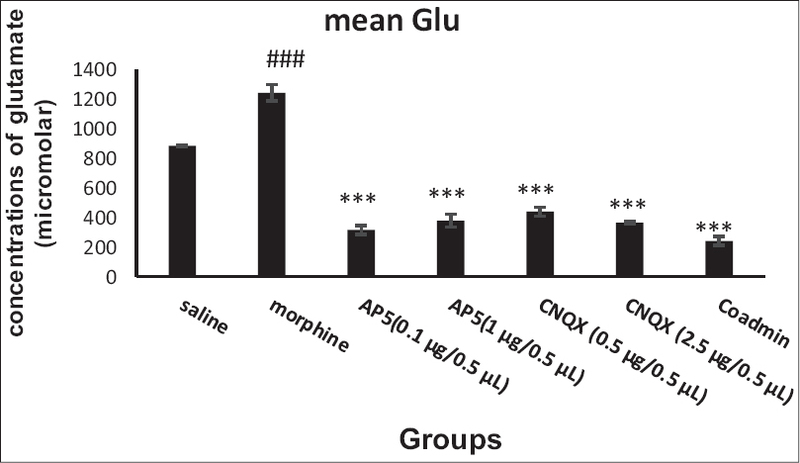 As shown in [Figure 1], there is a significant difference in the mean concentration of glutamate in the morphine group compared to the saline group (P ≤ 0.001). Microinjection of minimum and maximum doses of CNQX (AMPA antagonist) significantly decreased average concentration of glutamate (P ≤ 0.001). Similarly, two doses of AP5 (NMDA antagonist), had a significant effect on the average concentration of glutamate in comparison with the morphine group (P ≤ 0.001). The ANOVA showed that the mean concentration of aspartate significantly increased in morphine group compared to saline group (P ≤ 0.001). 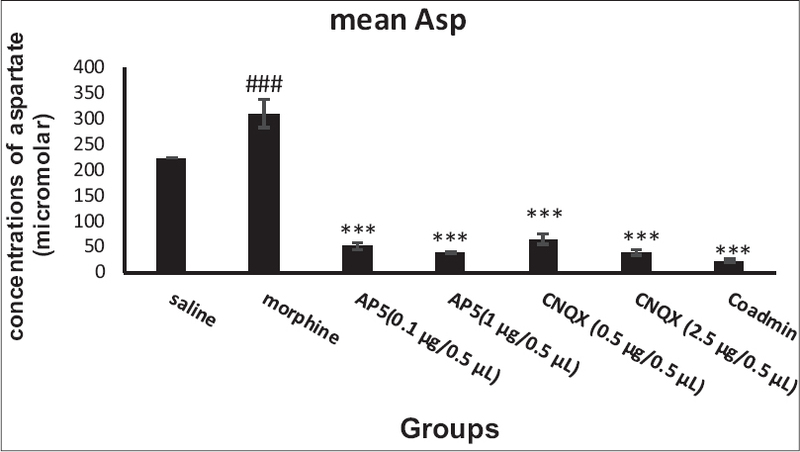 [Figure 2] indicated the significant changes of aspartate in the PrL after usage of AP5 and CNQX compared to morphine group (P ≤ 0.001). 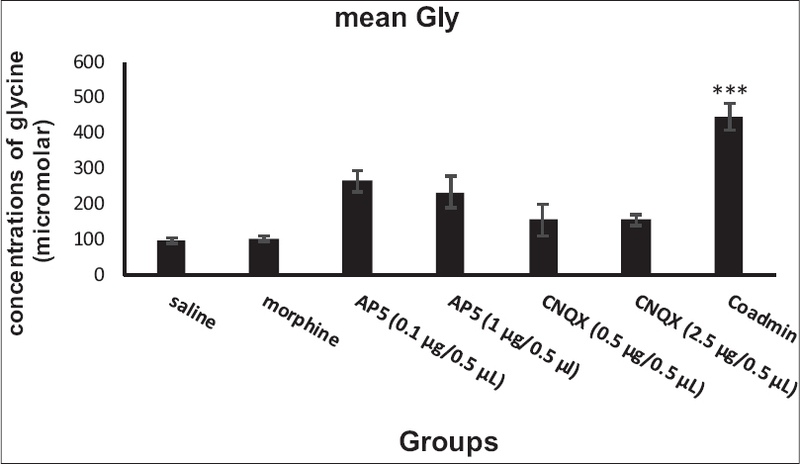 Coadministration of maximum doses of AP5 and CNQX significantly decreased the mean concentration of glutamate and aspartate compared to morphine group [Figure 1] and [Figure 2]. The mean concentration of glycine had not changed in the morphine group compared to the saline group. AP5 and CNQX had insignificant effects on the average concentration of glycine, but blockade of two receptors significantly increased the mean concentration of it (P ≤ 0.001). The important finding in the present study is that in morphine addicted rats, the concentration of EAAs increased in the prelimbic area. These increases were blocked by their selective NMDA and AMPA receptor antagonists [Figure 1] and [Figure 2]. These results suggested that morphine addiction is associated with the transmission of EAAs in the PrL cortex through the NMDA and AMPA receptors. Previous studies have shown that morphine changes, the concentration of various neurotransmitters, including glutamate, in the brain regions that have been associated with addiction. Our results also indicated that morphine-induced elevation of glutamate and aspartate concentration within PrL cortex [Figure 1] and [Figure 2]. Similar results have been reported by others in the mPFC and other areas of the brain. Alaei et al. by microdialysis method reported that morphine increased glutamate concentration in the VTA. Zheng et al., using an optogenetic method, showed that morphine specifically increased glutamate secretion from mPFC terminals to the VTA. The injection of tetrodotoxin into mPFC and the inactivation of neurons in this region eliminate morphine-induced stimulation in the activity of the dopaminergic neurons of the VTA. There are similar findings for other drugs abuse for example, the heroin self-administration increased glutamate concentrations in the Nucleus Accumbens (NAc), and this increase depends on the inputs of the PrL. In addition, increased glutamate secretion from the prefrontal cortex to the NAc mediates the cocaine seeking. However, the source of the glutamate elevation in the mPFC in addicted animals was not determined. Glutamate can be released from both mPFC afferent terminals and axon collaterals of pyramidal neurons. The mPFC receives glutamatergic projections from the hippocampus and amygdala. Previous studies have demonstrated that the mPFC is one of the several cortical areas implicated in the actions of opiates. Dense opioid receptors (μ, δ, and κ) located within this area also provide anatomical basis for its contribution to the actions of morphine. Morphine, which mainly binds to μ-opioid receptors, alters glutamate transmission in different area of the brain. According to these studies, coapplication of morphine and glutamate receptor antagonists can block the drug-seeking behaviors.,, The mechanism underlying the interaction is regarded to be postsynaptic or presynaptic. The glutamate receptor and opioid receptor can be coexpressed in the same neurons. Opioids can act on its receptor and induce the disinhibition of GABAergic interneurons, which causes the release of glutamate and the activation of glutamate receptors. The fact that usage of glutamate receptor antagonists reduced glutamate concentrations suggested that NMDA and AMPA could act on either presynaptic receptors or receptors located on astrocytes to increase extracellular glutamate in the PrL. In this respect, it is interesting that a study has shown that glutamatergic agonists can stimulate the release of glutamate from astrocytes. The results of this study reflect the changes in extracellular concentration of glutamate in the PrL which might be due to alteration in glutamate release from neuronal cells or glial cell by morphine [Figure 1]. It is clear that more studies about the effect of morphine addiction on neuronal content of glutamate are needed. Microdialysis studies in rats have shown the efflux of glutamate and aspartate are often parallel to one another in many brain regions. It has been shown that the two EAAs are colocalized or could be stored in separate vesicle populations within the same excitatory nerve terminal. With regard to [Figure 1] and [Figure 2] that show two excitatory neurotransmitters have the same pattern, our data suggest that glutamate and aspartate effluxes may be evoked dependently, implying the involvement of same nerve terminal. The knowledge about glycine transmission in the addiction is still poorly understood. Emerging information indicate that glycine receptors (GlyRs) are expressed by neurons in the mPFC and GlyR activation is capable of controlling the activity of excitatory circuits in mPFC. Our results showed that self-administration of morphine had no significant effect on glycine concentration in the PrL, but simultaneous blockade of NMDA and AMPA receptors increased this inhibitory neurotransmitter [Figure 3]. Chau et al. showed that the metabotropic glutamate receptor 5 (mGluR5) antagonist (MPEP) increased glycine concentration. In addition, the lower dose of MPEP did not raise the detected levels of glycine. Shin et al. with regard to inhibitory effect of glycine suggested that glycine may be useful for the prevention and therapy of the adverse action of morphine. Thus, it can be presumed that usage of glutamate receptor antagonists useful for the treatment of morphine addiction through depression of EAA and elevation of glycine in the PrL cortex. There is no doubt that glycine is an inhibitory neurotransmitter in the CNS, acting on its own receptors, which functionally resembles the GABA receptors. On the other hand, glycine was defined as a coagonist of glutamate. That means in the absence of glycine, glutamate failed to activate the NMDA receptor. In recent years, more studies have been carried out to identify compounds which would inhibit function of the NMDA receptors indirectly. Our findings provide an evidence of interaction between morphine and glutamatergic system in the PrL. It is suggested that morphine can change extracellular level of glutamate through μ receptor that is located presynaptically or postsynaptically on glutamatergic terminals in the PrL cortex. The present study demonstrated that self-administration of morphine increased glutamate levels in the PrL, suggesting that excitatory effect of morphine on glutamate levels in the PrL is closely involved in opiate reinforcement. The results of this study indicate that the usage of NMDA and AMPA receptor antagonist in the PrL reduces the tendency to use morphine by changing the transmission of EAAs. In addition, glycine and glutamate interactions within PrL can be used as targets for the future research. The authors would like to express their gratitude to Isfahan University of Medical Sciences and Dr. Radahmadi for their assistance during this protocol. Miller CA, Marshall JF. Altered prelimbic cortex output during cue-elicited drug seeking. J Neurosci 2004;24:6889-97. Ventura R, Alcaro A, Puglisi-Allegra S. Prefrontal cortical norepinephrine release is critical for morphine-induced reward, reinstatement and dopamine release in the nucleus accumbens. Cereb Cortex 2005;15:1877-86. Ruzicka BB, Jhamandas KH. Excitatory amino acid action on the release of brain neurotransmitters and neuromodulators: Biochemical studies. Prog Neurobiol 1993;40:223-47. Gass JT, Olive MF. Glutamatergic substrates of drug addiction and alcoholism. Biochem Pharmacol 2008;75:218-65. Tomek SE, Lacrosse AL, Nemirovsky NE, Olive MF. NMDA receptor modulators in the treatment of drug addiction. Pharmaceuticals (Basel) 2013;6:251-68. Guo Y, Wang HL, Xiang XH, Zhao Y. The role of glutamate and its receptors in mesocorticolimbic dopaminergic regions in opioid addiction. Neurosci Biobehav Rev 2009;33:864-73. Carr DB, Sesack SR. Projections from the rat prefrontal cortex to the ventral tegmental area: Target specificity in the synaptic associations with mesoaccumbens and mesocortical neurons. J Neurosci 2000;20:3864-73. Lorrain DS, Baccei CS, Bristow LJ, Anderson JJ, Varney MA. Effects of ketamine and N-methyl-D-aspartate on glutamate and dopamine release in the rat prefrontal cortex: Modulation by a group II selective metabotropic glutamate receptor agonist LY379268. Neuroscience 2003;117:697-706. Adams BW, Moghaddam B. Effect of clozapine, haloperidol, or M100907 on phencyclidine-activated glutamate efflux in the prefrontal cortex. Biol Psychiatry 2001;50:750-7. Steciuk M, Kram M, Kramer GL, Petty F. Immobilization-induced glutamate efflux in medial prefrontal cortex: Blockade by (+)-mk-801, a selective NMDA receptor antagonist. Stress 2000;3:195-9. Nowak K, Meyza K, Nikolaev E, Hunt MJ, Kasicki S. Local blockade of NMDA receptors in the rat prefrontal cortex increases c-Fos expression in multiple subcortical regions. Acta Neurobiol Exp (Wars) 2012;72:207-18. Alaei H, Huotari M, Piepponen PT, Ahtee L, Hanninen O, Mannisto PT. Morphine releases glutamate through AMPA receptors in the ventral tegmental area: A microdialysis study in conscious rats. Med J I R Iran 2003;17:225-31. Paxinos G, Watson C. The rat Brain in Stereotaxic Coordinates. 5th ed. San Diego, CA: Academic Press; 2005. De Jaeger X, Bishop SF, Ahmad T, Lyons D, Ng GA, Laviolette SR, et al. The effects of AMPA receptor blockade in the prelimbic cortex on systemic and ventral tegmental area opiate reward sensitivity. Psychopharmacology (Berl) 2013;225:687-95. Bishop SF, Lauzon NM, Bechard M, Gholizadeh S, Laviolette SR. NMDA receptor hypofunction in the prelimbic cortex increases sensitivity to the rewarding properties of opiates via dopaminergic and amygdalar substrates. Cereb Cortex 2011;21:68-80. Sahraei H, Poorheidari G, Foadaddini M, Khoshbaten A, Asgari A, Noroozzadeh A, et al. Effects of nitric oxide on morphine self-administration in rat. Pharmacol Biochem Behav 2004;77:111-6. Alaei H, Pourshanazari AA, Rafati A. Electrical stimulation of nucleus raphe dorsalis changes morphine self-administration and withdrawal symptoms in rats. Pathophysiology 2002;9:1. Clarke G, O'Mahony S, Malone G, Dinan TG. An isocratic high performance liquid chromatography method for the determination of GABA and glutamate in discrete regions of the rodent brain. J Neurosci Methods 2007;160:223-30. Knox D, Perrine SA, George SA, Galloway MP, Liberzon I. Single prolonged stress decreases glutamate, glutamine, and creatine concentrations in the rat medial prefrontal cortex. Neurosci Lett 2010;480:16-20. Piepponen TP, Skujins A. Rapid and sensitive step gradient assays of glutamate, glycine, taurine and gamma-aminobutyric acid by high-performance liquid chromatography-fluorescence detection with o-phthalaldehyde-mercaptoethanol derivatization with an emphasis on microdialysis samples. J Chromatogr B Biomed Sci Appl 2001;757:277-83. Farahmandfar M, Karimian SM, Zarrindast MR, Kadivar M, Afrouzi H, Naghdi N, et al. Morphine sensitization increases the extracellular level of glutamate in CA1 of rat hippocampus via μ-opioid receptor. Neurosci Lett 2011;494:130-4. Zheng P, Yang L, Chen M. Morphine Selectively Promotes Glutamate Release from Glutamatergic Terminals of Projection Neurons from Medial Prefrontal Cortex to Dopamine Neurons of Ventral Tegmental Area. BioRxiv Preprint First Posted Online; 2017. Available from: http://www.dx.doi.org/10.1101/133090. Ceglia I, Carli M, Baviera M, Renoldi G, Calcagno E, Invernizzi RW, et al. The 5-HT receptor antagonist M100,907 prevents extracellular glutamate rising in response to NMDA receptor blockade in the mPFC. J Neurochem 2004;91:189-99. LaLumiere RT, Kalivas PW. Glutamate release in the nucleus accumbens core is necessary for heroin seeking. J Neurosci 2008;28:3170-7. McFarland K, Lapish CC, Kalivas PW. Prefrontal glutamate release into the core of the nucleus accumbens mediates cocaine-induced reinstatement of drug-seeking behavior. J Neurosci 2003;23:3531-7. Xie X, Steketee JD. Repeated exposure to cocaine alters the modulation of mesocorticolimbic glutamate transmission by medial prefrontal cortex group II metabotropic glutamate receptors. J Neurochem 2008;107:186-96. De Vries TJ, Shippenberg TS. Neural systems underlying opiate addiction. J Neurosci 2002;22:3321-5. D'Souza MS. Glutamatergic transmission in drug reward: Implications for drug addiction. Front Neurosci 2015;9:404. Del Arco A, Mora F. NMDA and AMPA/kainate glutamatergic agonists increase the extracellular concentrations of GABA in the prefrontal cortex of the freely moving rat: Modulation by endogenous dopamine. Brain Res Bull 2002;57:623-30. Cavallero A, Marte A, Fedele E. L-aspartate as an amino acid neurotransmitter: Mechanisms of the depolarization-induced release from cerebrocortical synaptosomes. J Neurochem 2009;110:924-34. Liu Y, Huang D, Wen R, Chen X, Yi H. Glycine receptor-mediated inhibition of medial prefrontal cortical pyramidal cells. Biochem Biophys Res Commun 2015;456:666-9. Chau P, Süderpalm B, Ericson M. The mGluR5 antagonist MPEP elevates accumbal dopamine and glycine levels; interaction with strychnine-sensitive glycine receptors. Addict Biol 2011;16:591-9. Shin KW, Hong JT, Yoo HS, Song S, Oh KW. Inhibitory effects of glycine on morphine-induced hyperactivity, reverse tolerance and postsynaptic dopamine receptor supersensitivity in mice. Arch Pharm Res 2003;26:1074-8.